PeakTrader.com :: View topic - FOMC Announcement: New SPX Highs? FOMC Announcement: New SPX Highs? 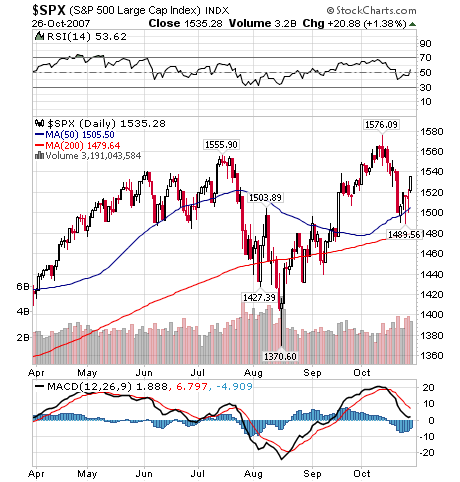 Posted: Sun Oct 28, 2007 4:56 am Post subject: FOMC Announcement: New SPX Highs? Two weeks ago Fed Funds Rate Futures showed a 25% chance the FOMC will ease 25 basis points Wednesday, October 31st (two-day meeting). However, the odds of a 25 basis points easing have risen to about 70%, along with about a 20% chance of a 50 basis point cut, or about a 90% chance of an easing. Consequently, financial and retail stocks, which lagged on negative economic data recently, may outperform. 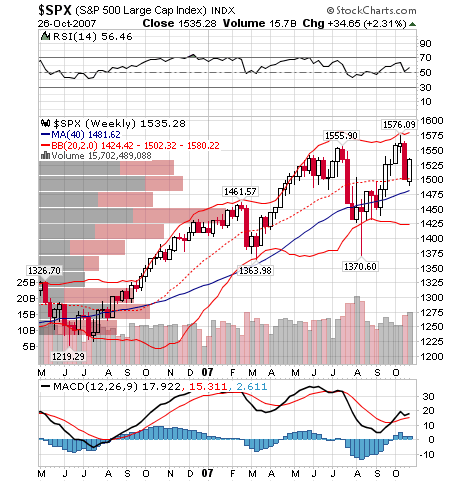 The SPX seven month daily chart and 1 1/2 year weekly chart below show the bullish inverse head & shoulders low, above 1,480, held recently. The stock market is entering the seasonally bullish period of November to May, after tax loss selling in October. So, SPX may rise to 1,650 within a few months, rather than break below 1,480, which may lead to a further fall to 1,425, or lower (i.e. weekly lower Bollinger Band).